My friend, there is a problem here. Israel has been occupying Palestinian land since 1948. They treat Palestinians like they are less human and this they have continued to do especially with support from the US of A and a few European countries. It is wrong to see Palestinians as terrorists. I agree it is cowardly to attack civilian bases or anyone for that matter, but Israel and her allies must be ready to sit down with Hamas and whoever leads Palestine to come to a peaceful resolution of this matter! America and the world at large must change their policy towards the Middle East and it is time we treated each other humanely. No blockades to Gaza and West Bank, no arbitrary arrests and so on. All rational people and I know you are must speak up against these senseless bombings of innocents on either side and a meaningful and sustainable ceasefire of all hostilities between the two nations. Well, perhaps I was not clear enough about my message. As I mentioned in my post, I’m actually on the fence about my political feelings regarding the Israeli-Palestinian dispute. This post isn’t focused on that. I’m trying to draw attention to the fact that immoral war practices as have been somewhat successfully used against Americans (because America can be harmed greatly by a negative world image) will not work against Israel (because they care less about their world image and more about their territorial security). So, I’m not actually taking sides here, and I do agree with what you’ve said to a great extent. Now i get what you mean. Thanks for the clarification 🙂 But you and me agree that Israel has been allowed to get away with it for so long they think it is right. – They get the same health care benefits, and the same job benefits, for the same prices. – They do not have to put their sons’ lives on the line in order to make sure that their sons are not killed by terrorists and that their workplaces are not blown up. – They work (much to many Israelis’ dismay) in the same workplaces, in the same environments, earning the same pay, and living in the same areas, as everyone else. – The learn in the same colleges. – The government funds their studies, and there are special grants for Palestinian students. – They are allowed to live, and can live safely, in any part of the country they choose. Jewish Israelis, on the other hand, are barred from certain roads and areas, and other roads and areas, although permitted to them, are extremely dangerous. – Palestinians do not usually get murdered in cold blood when they are at home, in their beds, with their children – and with no prior warning, war, or antagonism. Jewish Israelis do. – Israelis do not usually get on Palestinian busses and blow them up. Nor do they leave bombs at phone booths, walk a few meters away to set it off, and then proceed to watch the carnage with great satisfaction. – The electricity in Gaza is provided by the Israel Electric Company. Gaza has not paid their electric bill (which now amounts to 700 million NIS), but the electric company still services them – this despite the fact that it is dangerous to do so, and the electricity is used to aid murdering Israelis. And the government is helping cover the deficit caused by Gaza electric usage. – If a Jewish Israeli builds his home without the proper paperwork – and sometimes even when he does have the proper paperwork – he can count on it being destroyed. If a Palestinian builds without the proper paperwork, he can count on living there until the end of his long life. In addition, any other country who wins a war can count the land they conquered as their own. Why can’t Israel? If Israel is “occupying” the land, then so is Britain, so is America (what about the Native Americans? That’s not an occupation? That’s not a takeover? ), and so are many other countries. By the way – I live in Israel. I see the news, I see the people whose lives are disrupted by terrorists and terrorist groups. I live with the terror of the bus that I and my baby are on, being blown up. I live with the terror of being shot at when I am in a taxi. You don’t. Learn the facts, then voice your opinion. litleduckies, do you mean to tell me there was a state called Israel prior to 1948? I don’t live in Israel or Palestine but I know you are lying. Israel blockades Gaza and the westbank, the current Israeli boundaries are not where they were in 1969. Are you saying the Palestinians who die from Israeli air raids deserve to die or that is not cold blood? What war did Israel fight prior to 1948 to claim Palestinian territory? Don’t believe everything your parents tell you, sometimes they lie to you. You have asked me if what the Americans, the Australians did to the native tribes is not occupation, it is by all means and doesn’t make it right. You can’t justify it, you can’t wish it away. It is wrong whether 1 person does it or nations, it will remain wrong. I did not say that there was a state called Israel before 1948. However, there was a nation called Jews, Israelites, and so forth. On the other hand, there was no such people as “Palestinians” before the State of Israel was created. And that makes all the difference. The Jewish people have long existed. The “Palestinian” people are simply Muslims who decided to call themselves Palestinians. It is not an actual people, or an actual nation. The boundaries of Israel are not where they were. Israel won wars, and expanded its boundaries, just like many other countries did. And Israel would not start an air raid if rockets had not fallen on innocent Israeli citizens. “Palestinian” air raids, or rather, Hamas air raids, occur whether or not Israel takes any military action. We only retaliate when we can no longer take the terrorizing and murdering of innocent civilians. If what the Americans, Australians, and British did is not right – why are you only slamming Israel? And it may not be nice, or fair, or right, but this is the way the world works. Israel has just as much of a right to do so as anyone else. You don’t like it? Slam everyone for doing it. But don’t just slander one little country who simply wants to live in peace – and is not being allowed to do so. Where do you learn history from? From your holy books Israel and Palestine are mentioned how then do you say they declared themselves a state after 1948 but never existed before then. How is this different from the creation of Israel. Tell me something, prior to 1948 are you telling me those lands currently occupied by Israel were wastelands with no inhabitants? I have said severally that it is wrong for one person to oppress another, it is wrong for some nation to occupy another whatever the state and there is no way this can be justified. And to think Israel is justified in doing it is wishful thinking. This is wrong now, it was wrong before and will remain wrong even in future. Let me ask you this, if I was to forcefully occupy your house, restrict your movements would you not feel a resentment? And when you can’t take it anymore, will you not resort to any means necessary to show your displeasure. Think about it. Well, I don’t know Makagutu personally, but I’m pretty sure he wasn’t around to wipe out the natives in his country 🙂 so, why can’t he be critical of both his own country and Israel? That’s not hypocritical, in my opinion. First of all, the Philistines in the Bible are not the same people we have today. These people never claimed to be Philistines until 1948. Second of all, the Philistines from the Bible were completely wiped off the map a long time ago. Israelites, as a nation, have existed long before that. If you think that “occupation” is wrong, then let’s give the land back to the Canaanites. They were the first ones here. Not the Philistines, not the Jews. And definitely not the Palestinians. If you are going to get mad at Israel, get mad at every other country in the world as well. Don’t just get mad at Israel. By the way, I had to stop writing this comment because an air-raid siren went off – Hamas, in charge of Gaza, fired a rocket at us. Think about how YOU would feel if you were living under constant fire and constant threats of terrorism. Then tell me what you think. I live with this. You don’t. So, if you want to get an idea what Israel is about, come on over. We’d love to have you. I sympathize with you about the air raids. In fact, I oppose them completely, they are not the way to resolve to the problem. At the moment in Nairobi, it is not a threat of air raids but a bunch of lunatics throwing grenades at buses, churches and so on. Am afraid to go to the bar, since am no longer certain when one idiot is going to throw a home made bomb or grenade into the bar. Now you ask i slam every occupying force, you should realize this post is addressing Israel/ Palestinian conflict. We can address China/Tibet, Australia/Aborigines and so on in another but we must be agreed here that there is no justification for war. This is the issue at the core and we must not be afraid to condemn what is wrong! I don’t think it’s fair to claim that if someone hasn’t lived through a terrible event then they can’t say anything about it. What if they have studied it thoroughly? Do they have no say? What about an ignorant person who has never picked up a book who has lived through a terrible event? Are they qualified to speak on it? The irony is that I am very anti-Hamas, but your arguing style is making me wonder about how Israelis view their situation… 😦 You should be taking the high road and let Hamas play the victim card. So you have every right to have any opinion on it without sounding hypocritical. If and American who slaughtered Native Americans said, “american policy against the Indians is atrocious” that wouldn’t make any sense. That was my point. Makagutu – You are right; this post was not about other conflicts, but rather about Israel/Hamas. As long as you are prepared to slam everyone else, I will concede the point: War is wrong. However – I think you should tell that to Hamas. We don’t want war, we just want to live in peace. That is why we gave Gaza as a present to the Palestinians – to make peace, even at the expense of Israeli citizens, many of whom, until today, have no jobs and no homes. They took our present and used it to throw rockets at us. That is why we went to war – because if it is going to be a war, it may as well be two-sided. I condemn war; I hate war. I hear you and feel for you about the lunatics throwing grenades. Thankfully, we haven’t had bus incidents for a while, but it is still fresh in our memories. Also thankfully, most buildings have security to prevent exactly what you described from happening in churches and other public places. TGA – You are right, we should be taking the high road. I feel like the media presents Hamas as victims – in reality, many of the people in Gaza who die, die because Hamas is irresponsible – many of them die or are injured from rockets that Hamas misfired (and then blamed on Israel). I wish the media would stop displaying Hamas as innocent victims, though. You are also right that if I said the opposite, it would be hypocritical. I guess I’m just sick of the world slamming Israel for doing what every other civilized country would do in our place. And considering no other country in the world has to put up with what we’re going through on a daily basis, I think I have a right to feel that way. It’s good to see that your tone has changed a little now. I have never had missiles launched at me, so I can’t say whether or not I wouldn’t be a little emotionally driven in my comments in that situation. Hopefully, all is well with you and your neighbours. I agree that Hamas has a ridiculous strategy of aggression against Israel and when Israel retaliates, holds up dead babies to show to the world. It’s pathetic really. One thing, I’d advise against, however, is calling the Gaza strip a “present.” That kind of language is not neutral at all, and in fact doesn’t demonstrate the facts as they are. A present implies something given because you like someone or you want to make someone happy. This is not the reason for the handover of Gaza — it’s much more complicated than that. Such an oversimplification will only inflame tensions in the region. Are you seriously asserting that Palestinians are treated better than Israelis in Israel? That’s a little hard to believe. As I’ve said before, I’m on the fence on this issue; however, I do lean more toward the Israeli side. The reason I have not come down on either side is because there never seems to be an unbiased opinion on the issue. Ok, you may say everyone has a bias, that’s not what I’m talking about. I’m talking about people trying to convince you of things that are not true. So, I am unsure of how many lies I have been fed on both sides. We don’t have that saying in Israel. And I’m not trying to feed you lies; I’m telling you that a large portion of the Israeli population feels that the Muslims are treated better than the Jews in many ways. Every single example I listed is 100% true. Now, you can say that we are not searched the way Muslims are, or suspected as much as them. That has to do with statistics – who is dangerous and who is not. As an Israeli-American mother with a stroller, I sometimes get to skip security checks – just because I obviously don’t pose a threat. However, without my son, I have to go through every one of those security checks – because I am more of a statistical threat without my son than I am with him. It’s just part of life…and it’s the same in American airport security – families get it easier than people traveling alone. But, that’s the only thing I can think of – besides the fact that most of us hate Muslims and are not embarrassed to say so, but that goes both ways, because they hate us and are not shy about it, either – that Muslims are subjected to harsher treatment than Israelis. And again, everything I gave as an example is 100% true. Now, we’re getting into the meat of the argument. Since Israel is controlled by Israelis, and, as you’ve admitted, many Israelis hate Muslims (I personally would say I hate Islam, but not Muslims, but maybe that’s what you mean), then we have an obvious result: bad treatment of Muslims within Israel. I don’t want people on my side making mistakes though. Admitting that Palestinians are not treated as well as Israelis in Israel is not going to lose your argument that Hamas causes more problems for the peace and security in the Middle East than Israel does. I can give evidence from a previous comment you made. You said that Palestinians are treated equally and you gave a list of points. One of the points was that they can go to university and study alongside Israelis. Well, I hope so! Consider the implications of that statement. It takes the assumption that you think this is a benefit that Palestinians enjoy. This is actually something, however, that most people would assume. The fact that you have to draw attention to this insinuates that this is unexpected. Most of your points are good though, but you should be careful about what you state is a demonstration of equality between Israelis and Palestinians. If I were to tell you, “Black people in my country can let their children play in any park they want!” how would this sound? It should be noted though that the Israeli’s have also been known to commit their own atrocities midst a tumultuous climate within their war with Palestine. I wrote about this on my blog, I think that many of us have gathered an unsure perception about the inhabitants and the methods of the Middle East especially in war while indirectly diverting attention from the atrocities which both Israel and the USA have committed through history. 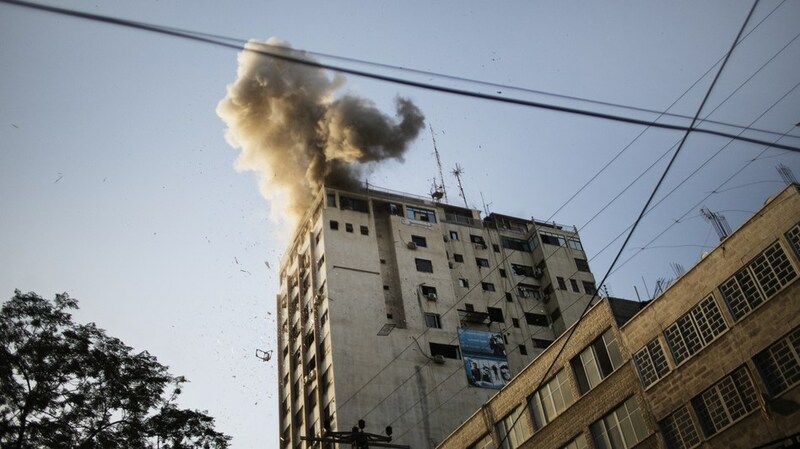 In regards to more recent developments, the Israeli’s have in fact launched heavily attacks within Gaza including a bold attack on a media outlet. These immoral and inconsiderate acts of war do not consider the lives of those who are affected, especially young children and women – this goes for both Palestine and Israel however. Though it is true that Israel has been defending their territory for a vast amount of time, we need to remind ourselves that, arguably, the worlds largest super-power is in support of their endeavors. A nation which itself has manifested a category of war atrocities in more recent history – the bombings of Nagasaki and Hiroshima ( seemingly long forgotten yet painfully symbolic of this barbaric nature) along with the unnecessary involvement in the Vietnam War which damaged the livelihood of many innocent Vietnamese. If you have some spare time, Google the My Lai massacre – a solid testament to this. My point to this is simple, Israel are in a top spot in comparison to Palestine. They have the support of a gigantic super-power, thus the threat should be to the Palestinians rather than the Israeli’s. Just my opinion on it, I try to avoid projecting an anti-American sentiment but it tends to jump out involuntarily. Thanks for posting this up, good to have a discussion about the issues. I’m not on either side like you, I think peace talks should be prioritized right now – innocent lives should not be taken for the pursuit of territory.. I wasn’t trying to come down on either side. I know that both sides have committed atrocities and made bad judgments. Israel should never have built settlements on occupied land, Palestinians should never have committed terrorist acts. These among many other issues are decisions that have only made the situation worse. Buddy, you know till quite recently Nelson Mandela was considered a terrorist by the US of A. I don’t like calling the acts of Palestinians terrorist and what the Israelis retaliation. They are all acts of war or aggression and we must call them that. Calling the Palestinians terrorists blurs the real issues and allows people to treat them less than they actually should be. I’m not sure which acts you’re referring to specifically; however, if you’re in the Chomsky camp of “all acts of violence are acts of terrorism, just from a different perspective” I would have to disagree. I think Chomsky has fallen off the deep end with this conception, and he seems unable to view the world even somewhat impartially. I understand that in some cases what is viewed as a freedom fighter is viewed as a terrorist by the opposing side; however, there are limits to this concept. When a suicide bomber blows himself up in a crowded civilian area, this cannot be considered the act of a freedom fighter, or the whole concept of a “freedom fighter” is tarnished. What I will admit is more debatable are the actions of Israel. However, Israel is not lobbing missiles randomly. They do try to hit specific targets. Calling this terrorism makes terrorism seem less terrifying and more rationalistic. But, I would contend that terrorism is not rationalistic. It’s purpose is to scare a population, not to kill specific targets. Innocent lives are only taken for the pursuit of territory by the side of Hamas. Israel is simply trying to defend its citizens. Israel is dependent on the American Empire. When it collapses, as it inevitably will, Israel will be between a sea and a Jihad. You are so evil to support a country like Israel who has killed MILLIONS of innocent CHILDREN, WOMEN & MEN! Hamas is a new entity but Israel is an old sick disgusting entity which to this day is MURDERING innocents and you support them?!!? Just goes to show how stupid your “logic” is! Had you accepted reality & supported the truth you would have been a muslim…. By the way, clearly you didn’t read my post fully, nor did you read any of my replies above or you’d realize that I never said I “support” Israel. Perhaps you should read before you start crying and replying in anger. Might make you seem a little less retarded. Just a thought. « Is this child’s death exploited enough for you?